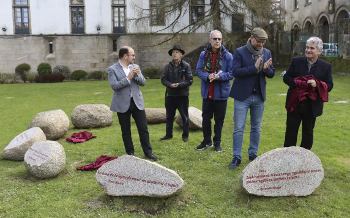 Bernardo Atxaga was in Santiago de Compostela last weekend to attend a literary event at the Talking Stones Garden (Xardín das pedras que falan), in which a stone inscribed with a poem by the Basque writer was installed. "The Talking Stones Garden" is the brainchild of writer Suso de Toro. Located in Santiago de Compostela, the capital of Galicia, the garden pays homage to writers from all over the world, using as medium stones etched with poems penned by the honored writers. The first stone installed in the garden has a poem by Galician writer Rosalía de Castro. To date the garden has texts by nine writers, and the plan is to install 40 talking stones. The latest additions are from Bernardo Atxaga, Marta Pessarodona, Kerstin Hensel, Zéno Bianu and Ramón María del Valle-Inclán. Last weekend’s event was attended by Bernardo Atxaga, Antonio López, Rector of the University of Santiago, and Martiño Noriega, mayor of Santiago de Compostela. eta horregatik ez zen hura berpiztu. and thus he was not returned to life. As Bernardo Atxaga himself explained, the text refers to a legend that he heard while in England. When Odin died, his kin went to the Kingdom of Death to ask that he be brought back to life. The guardians of the Kingdom replied that they would do so “on the condition that everything on earth weeps for his death.” Everything cried, except for the stones, and thus Odin was not brought back to life. This 16-word lamentation was Atxaga’s selection for the Talking Stones Garden. In the words of the project's creator, Suso de Toro, the Talking Stones Garden is highly symbolic. Located in the heart of the city, it showcases texts by internationally celebrated writers—men and women who have created a great diversity of literary universes. It is yet another demonstration of the city's status as a city of literature. Photo: La voz de Galicia.